The woodwork of the Quire of St George’s Chapel was carved from oak between 1477 and 1484 to form part of the decoration in the newly constructed chapel of Edward IV. Aside from scenes taken from literature and proverbs, there are also representations of legends, games, animals and all aspects of human life. It appears that individual carvers were free to choose the subject they wanted to represent, which has led to the misericords and stall-end finials [also known as popey-heads] being one of the richest collections of 15th century woodwork in the country. The popey-heads of the south side tell the story of the Virgin Mary. They are not arranged in order, and in many cases do not conform to the traditional story. The story starts with the Annunciation – the coming of the Angel Gabriel to the Virgin. The popey shows the Virgin surprised while reading, a fairly conventional treatment of the subject. This is followed by the Visitation, the meeting of Mary and her cousin Elizabeth, again a standard depiction. It is the next stages of the story which differ from the usual contemporary treatment. 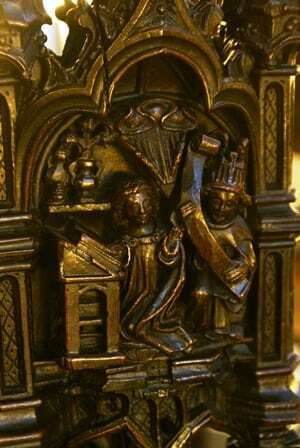 The popey-head of the Nativity of Christ shows the Virgin lying in a raised bed with Joseph sat on a stool by her feet. 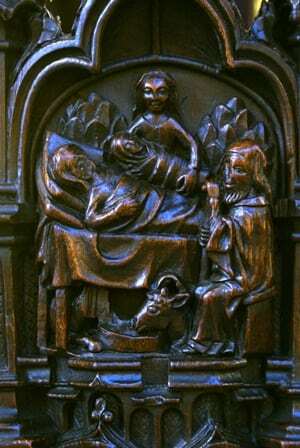 The infant Christ is held by a midwife standing in the background, and in the foreground an ox eats from a low trough. The presence of a handmaiden or midwife and the Virgin lying in bed is very unusual for the period. During the late 15th century when this popey was created, the Brigittine Adoration of the Virgin was far more common. The Order of St Saviour, more usually known as the Brigittine Order, was founded in 1346 by St Brigit of Sweden and soon spread across Europe, with Henry V founding a Brigittine Monastery at Syon House in Isleworth in 1415. St Brigit had a vision of the Nativity of Christ whilst travelling in the Holy Land. She saw the Virgin giving birth while kneeling at prayer in a cave, without help and without suffering; Joseph, having provided a candle for light, waits outside. Following the birth, a divine light bathed the unclothed Child while his mother and Joseph worshipped him with head bent and arms clasped. Her account of the Nativity had a great influence on Western art of the 15th and 16th centuries. Up to this point, representations of the Nativity tended to show Mary recumbent in bed with the swaddled child in a manger. Now Renaissance artists began to depict the infant Jesus, the sole source of light, lying on the ground with Mary and Joseph kneeling before him in adoration. However, the version depicted at Windsor shows no sign of Brigitinne influence, still conforming to the iconography of the early Middle Ages. The next part of the narrative depicted is the Adoration of the Magi. The three Kings present their gifts to the infant Christ, seated on his mother’s lap. Curiously for representations of the Magi, the biblical star is not visible, and the Virgin is not enthroned. The final part of the Life of the Virgin represented is the Assumption. The carver has portrayed the Virgin in a rayed mandorla, the ancient symbol of two circles overlapping to form an almond shape, often used in Christian art to represent the coming together of the divine and human. On each side of the Virgin is a kneeling layman, with a figure in clerical robes behind, and angels above. St Thomas generally appears in scenes of the Assumption, receiving the Virgin’s girdle, but the girdle is not depicted here. And who is the other man? Donors were sometimes represented in Marian cycles, but it would seem unlikely that Edward IV would be shown in this way. Could the carver have included himself in this image? The story of the life of the Virgin is a common one in Christian art, and it is not unexpected in a chapel which is dedicated to her and “our lady’s knight” St George. 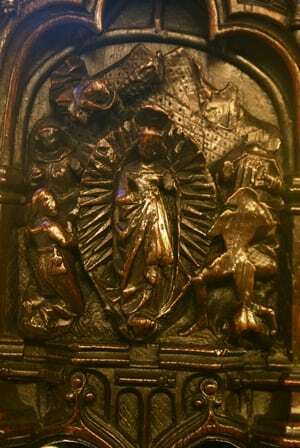 It is the variation in the illustration of the story that makes these popeys such an interesting and unusual set of medieval carving.